Multiple disease-related changes progress in parallel through distinct stages. Studying a mouse model of Alzheimer’s disease, neuroscientists at the Technische Universitaet Muenchen have observed correlations between increases in both soluble and plaque-forming beta-amyloid – a protein implicated in the disease process – and dysfunctional developments on several levels: individual cortical neurons, neuronal circuits, sensory cognition, and behavior. Their results, published in Nature Communications, show that these changes progress in parallel and that, together, they reveal distinct stages in Alzheimer’s disease with a specific order in time. In addition to its well known, devastating effects on memory and learning, Alzheimer’s disease can also impair a person’s sense of smell or vision. Typically these changes in sensory cognition only show themselves behaviorally when the disease is more advanced. A new study sheds light on what is happening in the brain throughout the disease process, specifically with respect to the part of the cerebral cortex responsible for integrating visual information. A team led by Prof. Arthur Konnerth, a Carl von Linde Senior Fellow of the TUM Institute for Advanced Study, has observed Alzheimer’s-related changes in the visual cortex at the single-cell level. Using a technique called two-photon calcium imaging, the researchers recorded both spontaneous and stimulated signaling activity in cortical neurons of living mice: transgenic mice carrying mutations that cause Alzheimer’s disease in humans, and wild-type mice as a control group. 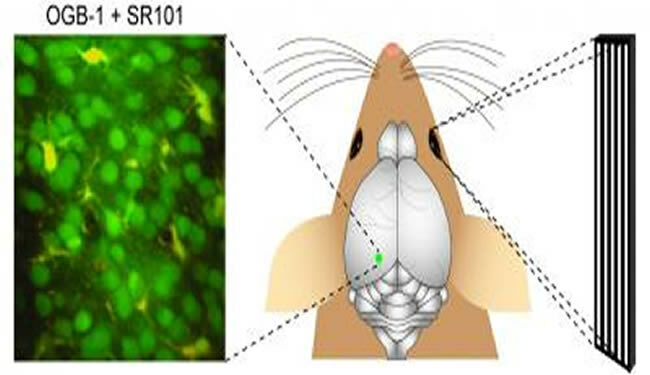 By observing how neuronal signaling responded to a special kind of vision test – in which a simple grating pattern of light and dark bars moves in front of the mouse’s eye – the scientists could characterize the visual circuit as being more or less “tuned” to specific orientations and directions of movement. Funding: This research was supported by the German Excellence Initiative (TUM-IAS, CIPSM); the German Research Foundation (DFG, IRTG 1373); ERAnet; and the Friedrich Schiedel Foundation. This schematic illustration shows the experimental arrangement for in vivo two-photon calcium imaging of stimulation-evoked neuronal activity in anesthetized mice. At left, in vivo two-photon image of the visual cortex. The neurons are stained with the calcium indicator dye Oregon Green BAPTA-1 (green, OGB-1) and the astrocytes with Sulforhodamine 101 (yellow, SR101). Right, visual stimuli were projected on a screen placed in front of the eye of the mouse. Image adapted from image credited to Konnerth lab, TU Muenchen. April 21, 2012 Antonio Casals M.